Egypt's President Abdel Fattah al-Sisi attends the opening ceremony of the 26th Ordinary Session of the Assembly of the African Union (AU) at the AU headquarters in Ethiopia's capital Addis Ababa (Tiksa Negeri/Reuters). It may seem that the Egyptian president is losing control of Egyptian politics and society, but he likely never had full control over it in the first place. Is Egypt melting down? It has an insurgency, a currency crisis, a brazen and brutal security apparatus that is sowing dissent, a phony political process, and a leader who has lost his grip. These are, at least, the reasons that have been outlined in various commentaries and analyses over the last few weeks or so. It may have reached a crescendo when President Abdel Fattah al-Sisi gave his disastrous (by all accounts) “Egypt 2030” speech. The Egyptian historian Khaled Fahmy called Sisi’s performance Qaddafi-esque. For those keeping score, that is not a compliment. Sisi rambled, wagged his finger at those in attendance, demanded that they only listen to him, and offered a number of loopy ideas for resolving Egypt’s indebtedness including putting himself up for sale. Despite the tough times, Egyptians—who are preternaturally hilarious—put their president up for sale on eBay. He was fetching more than $100,000 before the sale was taken down. Of course, Egypt’s present tribulations are no joke, but I wonder if much of the commentary, especially those parts of it related to Sisi, is not misleading. Egypt may be melting down, but I do not believe it is because the Egyptian president “has lost his grip,” if only because he never had one. Sisi sits at the fulcrum of the Egyptian state, but he has yet to consolidate his power. Unless one believed the garish, and quite frankly demeaning, “Sisi-mania” of the summer and fall of 2013, this should not be all that surprising. It took Gamal Abdel Nasser and his fellow Free Officers almost two years to consolidate power, and, contrary to the official narrative of that period, it was an intense political struggle that at times was quite violent. When Anwar al-Sadat became president after Nasser died in September 1970, it took him three years to gain full control of the state. During this time he cleverly outmaneuvered his rivals and Nasser loyalists in the Arab Socialist Union by cutting deals with a second rung of army and police officers in exchange for their support for the so-called Corrective Revolution in May 1971. Even then Sadat was still on shaky ground politically with the economy in shambles, the Israelis sitting on the eastern bank of the Suez Canal, and a student uprising in 1972 over what Egypt’s youth perceived quite correctly as the rather significant gap between Sadat’s saber rattling on Israel and the reality of his dithering. (As an aside, he was smart to dither. General Saad al-Shazli could not have pulled off the crossing of the Suez Canal—known as al-ubur, or “the Crossing,” in Egypt—in the fall of 1972.) It was only after Egyptian forces stormed the Bar Lev line on October 6, 1973, and kept a toe hold in the Sinai Peninsula that Sadat, who dubbed himself “Hero of the Crossing,” was able to be his own man. Former President Hosni Mubarak—a man who upon coming to office was widely ridiculed as a moron—also took some time to consolidate his power. He seemed shaky well into his presidency when he had to call out the military to put down Central Security Forces recruits who rioted across the country in 1986. This was a boost to the minister of defense, Field Marshal Abdel Halim Abu Ghazala, an extraordinarily charismatic officer who was a rival of Mubarak’s. In 1989, the president was finally able to sack Abu Ghazala. The field marshal had overseen a U.S.-sanctioned weapons pipeline to Saddam Hussein during the Iran-Iraq War, but when he tried shipping unauthorized equipment that would significantly aid Iraq’s rocket development program, Washington was more than happy to see him go. Needless to say, governing Egypt is a struggle and accumulating the power necessary to do is not easy, even for authoritarians. 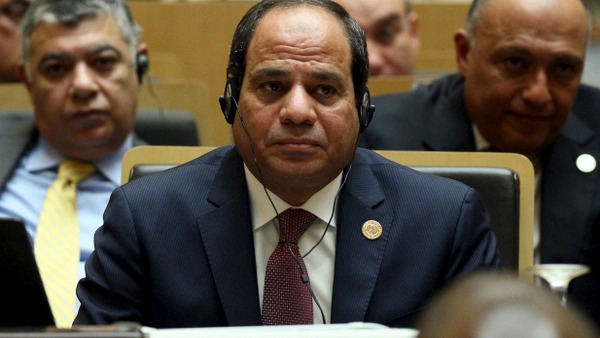 How do I know President Sisi has not consolidated power? I do not know for sure, but there are some clues. Too much of the analysis on Egypt tends to reinforce the notion that Sisi is cleverly pulling levers and pushing buttons in an effort to produce the outcomes everyone observes. It is a little too neat. Yes, Sisi is at the center of politics and while he is not an “evil genius,” he also is not stupid. The current mess that is Egypt’s political arena is a reflection of struggles among the major players who are seeking to protect their interests and turf. I have no doubt—as Sisi’s finger wagging episode suggests—that he has little interest in compromise and consensus. Egypt’s political and military elites (what’s the difference, really?) are authoritarians and thus have a particular commitment to coercion and force as a means of political control. That does not mean that Sisi has ordered all of the alarming disappearances of regime critics, the murder of Giulio Regeni, or the insane sentences that judges have meted out to people, including children. The best you could say is that Sisi is responsible by dint of being president or that he is guilty of nurturing an environment where these kinds of excesses are possible, but I’m not sure I would go as far as the latter. Take the Ministry of Interior, for example. It is true that Sisi appointed Major General Magdy Abdel Ghaffar as minister of interior, but that does not mean that the ministry is in Sisi’s hands. There are institutional rivalries and prerogatives that have an impact on the behavior of its leaders and employees. As I have previously written, the Ministry of Interior is a particular challenge for Egypt’s new leaders because it is can either keep streets quiet or unleash chaos, and since the Ministry of Defense is not inclined toward police work, the police generals and their minions get away with murder—literally. Then, of course, there is the judiciary. I remember back in 2006 when there was an uprising of judges in protest over the government’s effort to sanctions two justices, Hisham Bastawisi and Mahmoud Mekky, who charged that the results of the 2005 parliamentary elections were fraudulent. For some observers the protests were proof positive that Egypt’s judiciary was a force for good and could perhaps play an important role in pushing reform or even a transition to democracy. Egyptian judges in the streets also seemed to reinforce the notion that they jealously guarded their independence, which to some seemed to go hand-in-hand with reform and democracy. There were and still are, of course, factions of judges. There are also Egyptian judges who support the equal application of the law and have gone about their duties with professionalism and dignity. The benefit of hindsight suggests, however, that in 2006, when judges poured out into the streets to support Bastawisi and Mekky, they were undoubtedly interested in protecting the independence of the judiciary—or the shreds of it that still existed—but had no particular commitment to reform, much less democracy. If they were, the kinds of things that the judges have been doing would not be happening. Instead, the July 3, 2013, coup d’état has provided an opportunity for Egypt’s judiciary to stake its claim to a more independent role than the executive has permitted since the Nasser era. The absurd verdicts that judges have handed down in the last three years, including mass death sentences (which have not been carried out), are in part a function of unhinged justices, but also a reflection of the judiciary’s struggle to undermine the way it has been subordinated to the executive in the past. There are other examples, of course. Suffice it to suggest that there is a better, if not necessarily neater, way of looking at Egyptian politics. The current political environment reflects the all out power struggles at the summit of the Egyptian state pitting the presidency, the Ministry of Interior, the Ministry of Defense, and the judiciary against each other. The outward manifestations of this contestation are ugly. Many more Egyptians have lost their lives or find themselves in jail than for as long as most people can remember. This should give us some insight into Sisi’s command of the Egyptian state and the country’s instability, which should be self evident. As for the incumbent president’s durability, that remains an open question.